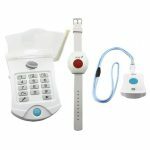 Designed to generate siren sound as well as switching from a regular white light into a flashing red light to draw more attention to your home during crisis. The GL 100 model is identical in operation as the GL 200, however the GL 100 has been equipped with a siren to draw more attention to your house. 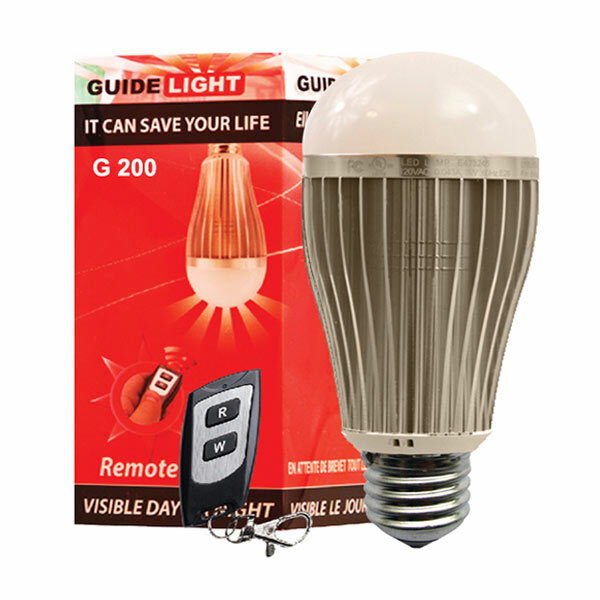 The GL 100 uses 220/110 volt, it is only 3 watts and is ULC and UL certified. The GL 100 has been designed to be used as an ordinary light on a daily basis when flipping the wall switch. However, when using the remote in an emergency the light will switch from a regular light bulb to a flashing red beacon light. The GL 100 model is an advanced version of the Guide Light. Now you have the ability to turn the light ON and OFF using the remote in both cases of regular usage and in emergencies that will activate the red beacon flashing light. The remote which is FCC certified is set to send signals of up to 50 meters in distance without obstacles and can activate the Guide Light within that range. We strongly suggest to test the light around your house to get familiar with Guide Light and to learn about the distance. 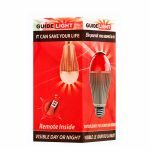 Guide light remote signal may not work there is concrete walls, metal doors or walls, some basements and some areas which could break the signals. Guide light remote signal may not work in some areas specially when there is concrete walls, metal doors or walls, some basements and some areas which could break the signals.